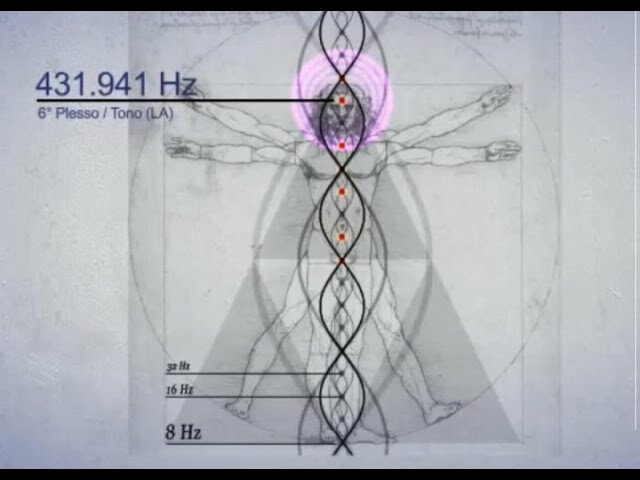 432 Hz (Hertz) is the Natural Tuning Frequency, also known as Verdi Tuning. Apparently being censored by today’s major music distributors. Musical note A (la) tuned to 432 Hz is the original pitch perhaps even since antiquity when Pythagoras determined the ratios of music scientifically and mathematically. His followers were not only mathematicians and scientists of the Ancient World, but musicians too! During the Roaring Twenties in 1926 shortly after WWI the American Music industry adopted 440 Hertz tuning as a standard. Now 440 Hertz tuning is a global ISO standard, but musicians of certain instruments can change their tuning back to 432 Hz. Hz is perfectly divisible by 2 and 3, however 440 (the current world standard tuning) is only divisible by 2. Perhaps this is why in sound wave experiments 432 Hz takes the shape of a triangle? Brass instruments like trumpet and saxophone can’t change their pitch (tuning) directly, but all stringed instruments like guitar and violin, and even piano can. Supposedly 432 Hz coincides with DNA synthesis, closely resembles the Schumann Resonance (the heartbeat of our planet), and opening of the Chakras. It is believed that 432 Hz tuning was mostly used in Ancient Egypt (and other ancient civilizations) all the way to the time of great Classical musicians of the 1800’s and even to some of the greatest musical artists of our time including Bob Marley and the Wailers, The Beatles, Jimi Hendrix, and Sade. It’s considered more perfect and more in tune with natural cycles. 432 Hz is a more calm energy than 440 Hz. 440 Hz (current music industry standard) is more tense by a magnitude of +8 Hz (440-432=8), thus higher frequency (pitch) and more tension. 432 Hz CENSORED by the Music Industry!